We know Atlantic Yards isn't dead, because things still keep getting brutally weird. The Courier-Life's Stephen Witt, who brought us the story of "the real land-grabbers," this week suggests that the real manipulators in the political system are the volunteer groups opposing a bailout for Forest City Ratner. And the victim of the "counter lobbying offensive" is developer Forest City Ratner, which is paying uber-lobbyist Al D'Amato in an effort to get federal stimulus money for the Atlantic Yards project. But the signers of the latest letter are not, as the headline suggests, "Yards opponents;" some are simply watchdog groups concerned with prudent infrastructure spending like the Straphangers Campaign and The Open Planning Project, as well as Good Jobs New York, notable for its scrutiny of subsidies, and the consultant Majora Carter. As DDDB points out, the statement that a letter to Governor David Paterson was "obtained by this newspaper," is a tad overstated, given that the letter was widely distributed via a press release. The article gets truly weird when it comes to ACORN, recipient of a $1.5 million bailout via Forest City Ratner. That fact, as well as ACORN's contractual obligation to support the project, naturally goes unmentioned. So I'll "be the editor." But Bertha Lewis, who heads the national organization, ACORN, and is a signatory of the community benefits agreement with FCRC, lambasted opponents of the project for trying to prevent anybody for applying for stimulus money. No one's trying to block "anybody"--in this case, it would have to be a government agency, not the developer--from applying for stimulus money. 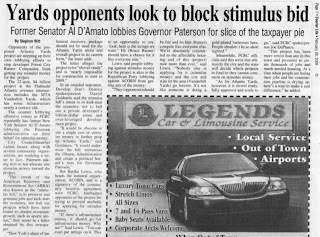 The letter asks Paterson not to award stimulus money to the project. "If there’s infrastructure money, it should go for infrastructure money. Why not?" Said [sic] Lewis. "You can even put strings on it. This is an opportunity to say, 'look, here is the strings we want.' He (Bruce Ratner) should have a chance for it like everyone else." Stimulus money doesn't go to private developers. Joe Sitt and David Walentas aren't applying either. Lewis said people lobbying against stimulus money for the project is akin to the Republican Party lobbying against ACORN from getting any of the money. Lewis is known for her background in theater. "They (opponents) should be fair and let him (Ratner) compete like everyone else. "We're absolutely committed to the affordable housing end of this (project) now more than ever," said Lewis. "Nobody else is applying for it (stimulus money) and the city and state let the area (Vanderbilt Yards) go forever. It’s not like someone is doing a gold-plated bathroom here. People shouldn't be so short sighted." No one else is applying for stimulus money? While Lewis may claim commitment, the developer has said the pace depends on the market. The city and state didn't put the working railyard out to bid before Forest City Ratner proposed its project. But that's the point--even an eminent domain defender like John Echeverria says the decision to pursue condemnation should be separate from the process of selecting a developer. And that sequence would've nixed Atlantic Yards. In eminent domain cases, it is unwise to count on the "kindness of strangers," whether judges or politicians. In Bedford County, Pennsylvania (about 2 hours from Washington), property owners are being hauled into federal court by Spectra Energy, backed by the power of the Federal Energy Regulatory Commission. The "public good" argument is that this is an underground natural gas storage site (bring gas from somewhere else, charge a fee for storing it, then send it to the northeast via piplines and charge another fee). What goes missing is that the landowners' property is sitting on top of the gas-rich Marcellus Shale; but they can't develop that because Spectra Energy wants to use the Oriskany sands layer (which lies just beneath the Marcellus) for its underground gas storage facility. In addition, Pennsylvania has more underground natural gas storage sites than any other state in the continental US, according to the Dept. of Energy. Further, in its most recent motion, Spectra Energy asked that the federal judge exclude evidence that would argue "economic loss to the landowner" for fear that the jury would be "confused, misled and distracted ... waste time." (From p. 7 of the motion: Case 3:08-cv-00154-KRG, Document 59). Here is the great conundrum in eminent domain: property owners possess the key asset that companies and government covet â€“ the land. But they are treated as a waste product in this process rather than as key stakeholders.